If you are not happy with your purchase, we will provide a refund at any time. Before or after getting the refund, please be sure to tell us about your problems so that we can fix them for everyone else. Also try the latest beta version if you haven’t already — the problem might be fixed there. 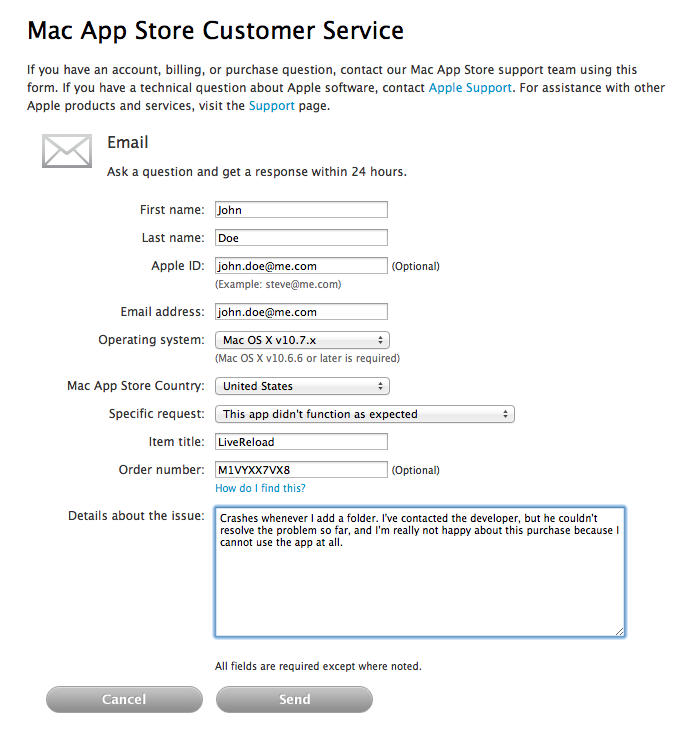 Apple does not provide any refund controls to the developers, so we cannot refund your Mac App Store purchase directly. You can either request a refund from Apple (procedure described below) or ask us to send your money back directly. Note that Apple does not officially support refunds; they do issue them regularly, but theoretically this is on a case-by-case basis. If Apple does not want to help you and you don’t have a PayPal account, we can work out something else (like an iTunes gift card if you’re in US). Please email support@livereload.com in any case — we’d love to know about the problems you have.